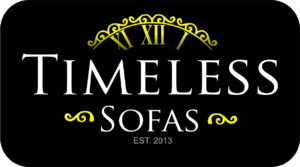 Here at Timeless Sofas we only use traditional British upholstery techniques to handcraft the finest quality furniture possible, all our chesterfield sofas are currently manufactured in Greater Manchester in the United Kingdom. Every step of our production process is supervised by our fully time served team of specialists to ensure only the best quality leaves our factory. All of the fabrics ranges we use are sourced in England and all surpass the expected EU fire regulations. All our leathers are top grain produced in from the finest tanneries in Italy. (all our leather furniture is full top grain leather we do not use any PVC, splits or Bi-cast leathers on any of them). All of our furniture frames are constructed from solid hard woods beech and birch which have gone through the drying process to make sure all the risks of structural weakness are eliminated. The Picture shows that our frames are screwed, glued, stapled and dowelled and made from hard wood. All our fibre and foam fillings surpass the British and EU fire safety standard and come with a fire label fixed to the base of your furnishing.